Having a backyard garden plot is a delight for millions of families -- and we think gardening is a great family activity. But if you're short on space, live in an apartment or have a backyard the size of a postage stamp, why not join (or create) a local community garden? You’ll be making the environment healthier for others, you can learn a ton from seasoned gardeners, and it’s a fun way for kids to see how enjoyable a community activity can be. So stock up on some kid-friendly growing varieties and read on for top tips on finding a local community garden and making the most out of your experience. Image © flickr user parker yo! 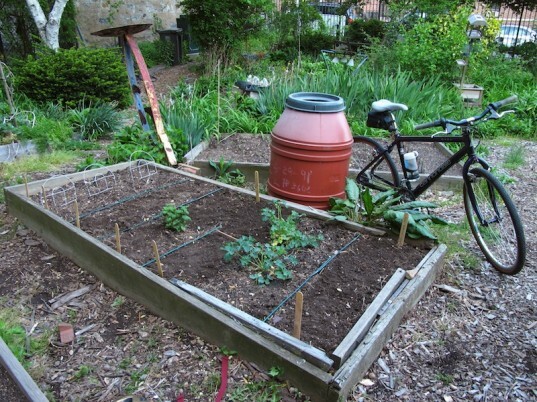 Community gardens are so popular in our area of West Philadelphia, that we were actually wait-listed for two years before being offered a half-plot at our present community garden! 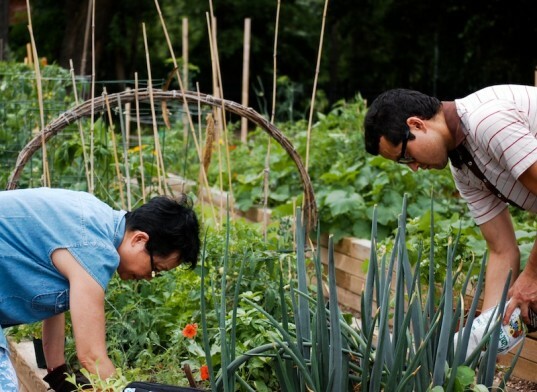 If you don’t see any community gardens in your neighborhood, ask around. Local gardening clubs will likely know where there are plots available, or you can check out this community garden database. And don’t be afraid to poke around a bit if there are unused plots of land near you. They may be a perfect space for a community garden just waiting to happen. 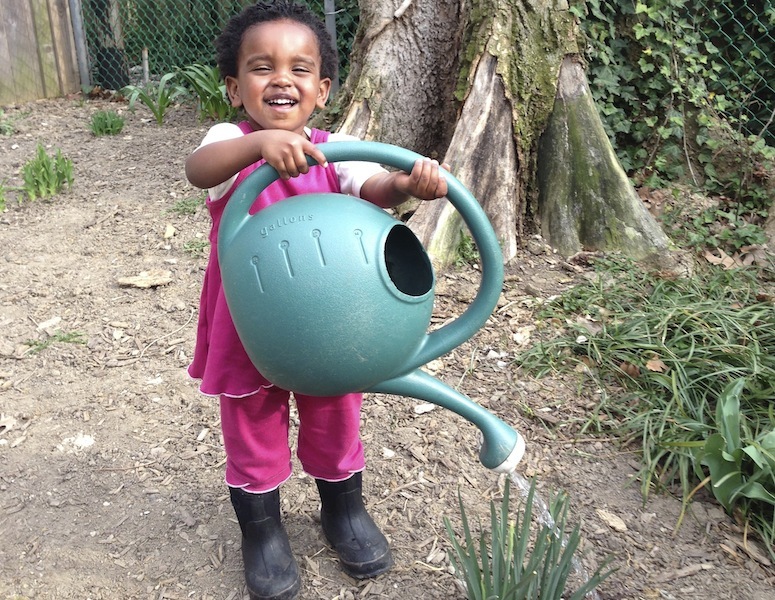 Be sure to check out the American Community Gardening Association’s site which features tons of resources including its “10 tips series” for starting a community garden and gardening with kids. At our community garden, new members are given a half-plot. Based on involvement and interest, in future years, they can upgrade to a full plot. As a family with young children who love to “help” with gardening, but who can also get into their fair share of gardening messes, starting small was great for us time-wise and resource-wise. It allowed us to control our plot and experiment with some new plants while still being of manageable size. It still yielded lots of tomatoes, peppers, beets, and plenty of herbs all summer long. 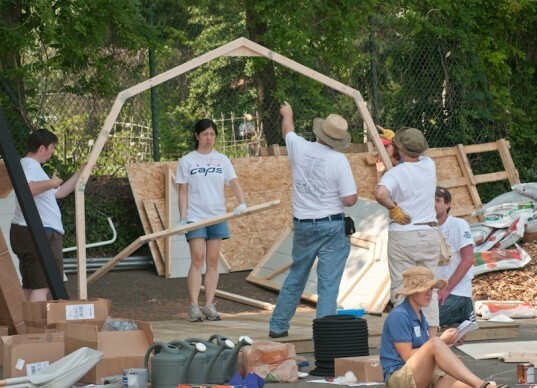 Suggest or help plan community work days and community potlucks. Getting to know your plotmates is a lot of fun and it helps to have informal meetings to discuss water usage, shared spaces and duties such as weeding and composting. One of the best parts about participating in a community garden is that kids learn teamwork, collaboration, and appreciation for nature. My husband attended a recent community garden work day and commented, “I was the youngest person there by about twenty years.” Which means, many of the other gardeners at our community garden have that much more experience working in the garden! Take advantage of their knowledge. We have a pretty diverse group of gardeners, some of whom grew up in Africa and Asia, so they have additional experience about certain fruits and vegetables and are more than willing to share this information (and their edibles) with our family. In return, your family will likely bring a breath of fresh air and some energy (as well as some young muscle power) into the garden. If kids can only look and not touch, participating in gardening will quickly seem like a chore instead of a fun family activity. 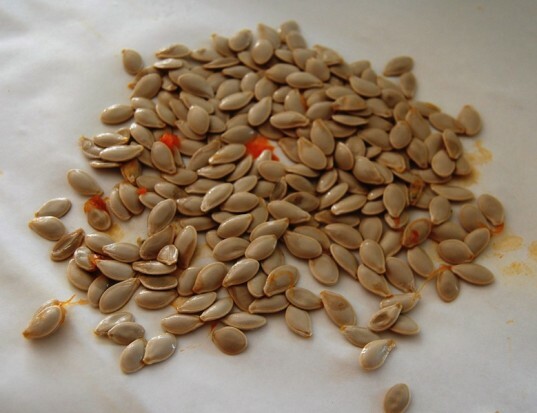 Teach your kids early on how to sow the seeds, how and when to water appropriately, and how to tell when a certain fruit or veggie is ripe. Discuss different foods or flower arrangements you will be making once the plants have grown. You can also give independent kids their own garden plot within your garden. They can make a little pathway or border with rocks, plant and care for whatever they choose, and will feel amazingly proud of “their” garden. 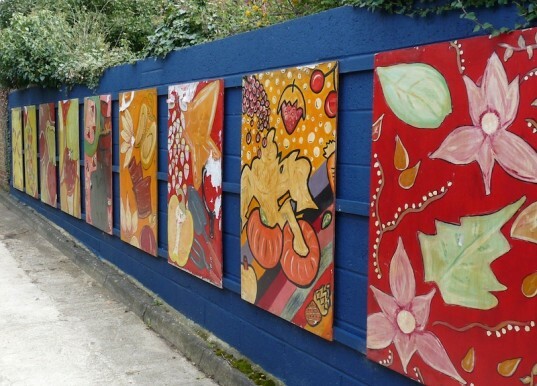 Make your community garden experience even more memorable by sharing it with others. Whether you help facilitate the start (or growth) of another community garden a few years down the road, bring in some cilantro or basil from the garden and make pesto with your child’s class, show your book club how to save seeds, or plan on giving some of your yields to a soup kitchen or homeless shelter, there are plenty of ways to take what your family has learned from community gardening and share its message with others. Just because the weather will get cold in a few months doesn’t mean the gardening fun has to end. If you have the time and expertise, you can construct hoop houses or simply plant greens like collards or cabbage that thrive in cold weather. Use the off-season to think of other ways to bring life into your community garden — such as painting a mural or constructing a greenhouse. We take our compost to our community garden year-round, helping to ensure nutrient-rich soil for everyone’s plot. Have a farewell party at the end of the harvest season as a way to see garden friends, discuss any unfinished business, and dream up plans for next year! Community gardens are so popular in our area of West Philadelphia, that we were actually wait-listed for two years before being offered a half-plot at our present community garden! If you don't see any community gardens in your neighborhood, ask around. 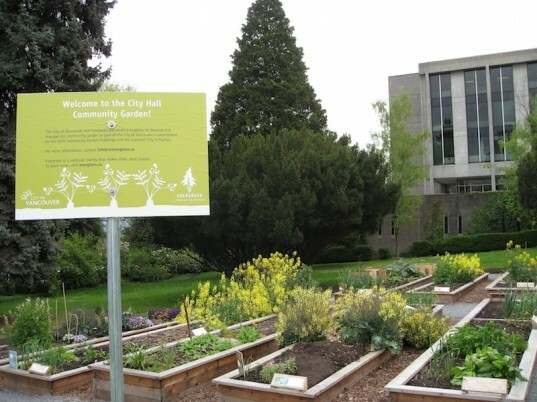 Local gardening clubs will likely know where there are plots available, or you can check out this community garden database. And don’t be afraid to poke around a bit if there are unused plots of land near you. They may be a perfect space for a community garden just waiting to happen. Be sure to check out the American Community Gardening Association’s site which features tons of resources including its "10 tips series" for starting a community garden and gardening with kids. 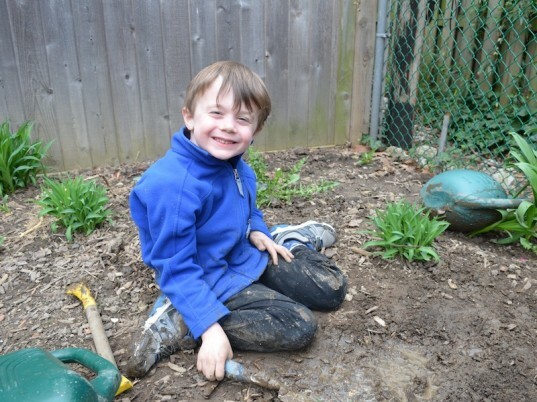 If kids can only look and not touch, participating in gardening will quickly seem like a chore instead of a fun family activity. Teach your kids early on how to sow the seeds, how and when to water appropriately, and how to tell when a certain fruit or veggie is ripe. Discuss different foods or flower arrangements you will be making once the plants have grown. You can also give independent kids their own garden plot within your garden. They can make a little pathway or border with rocks, plant and care for whatever they choose, and will feel amazingly proud of "their" garden. Just because the weather will get cold in a few months doesn’t mean the gardening fun has to end. If you have the time and expertise, you can construct hoop houses or simply plant greens like collards or cabbage that thrive in cold weather. Use the off-season to think of other ways to bring life into your community garden -- such as painting a mural or constructing a greenhouse. We take our compost to our community garden year-round, helping to ensure nutrient-rich soil for everyone’s plot. Have a farewell party at the end of the harvest season as a way to see garden friends, discuss any unfinished business, and dream up plans for next year!